The Butterfly Network: Havin' that cake, are ya? So perhaps the blonde in me is coming out a little bit - maybe this is easily answered - but can somebody please explain to me the concept* behind the saying: "she wants to have her cake and eat it too"? Because, when it's said, it's said negatively, as though you shouldn't want to have cake AND eat it. But what are you supposed to do? Have cake and just look at it? I don't think so. I'm not even a big cake person, I just think the expression is stupid. Seriously, imagine having a big slice of moist chocolate (or vanilla or marbled or whatever suits your fancy) cake in front of you. Perhaps there's a tall glass of milk to go with it. It's iced to perfection, not to much and not to little. And it's yours - you have it. Are you telling me that you're not supposed to want to eat it? I don't even like cake that much, but if there's a piece in front of me, I'm going to eat it. What would be the point of having cake without eating it? Are you just supposed to stare at it and think about how pretty it is? Or maybe you're supposed to ignore it, and pretend it's not there, while your stomach grumbles for it? So, forgive me if there's an easy explanation for this, I just don't see it. I really want to know the answer! *Also, just to clear a little bit up - I understand that it means that you can't have the best of both worlds. I just don't understand why a person would use the cake analogy because it does not make sense (to me)! Wouldn't it make more sense to say (if you HAD to use cake as an example) you can't eat your cake and have it too? I don't know the answers to the above.. but I DO know that I'm hungry. Thanks. To wish to have one's cake and eat it too (sometimes eat one's cake and have it too) is to want more than one can handle or deserve, or to try to have two incompatible things. This is a popular English idiomatic proverb, or figure of speech. 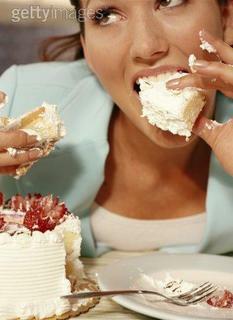 The phrase's earliest recording is from 1546 as "wolde you bothe eate your cake, and haue your cake? ", alluding to the impossibility of eating your cake and still having it afterwards; the modern version (where the clauses are reversed) was first signaled in 1812. Comedian George Carlin once critiqued this idiom by saying, "When people say, 'Oh you just want to have your cake and eat it too.' What good is a cake you can't eat? What should I eat, someone else's cake instead?" Have Your Cake and Eat It Too is a book by Susan G. Purdy. The two that irk me, in addition to the cake one, are when people describe a child as being the "apple of their mother's/father's eye" and when people say "Don’t cry over spilt milk." Makes me cringe. If you were a connoisseur of Mary-Kate and Ashley Olsen films, you never would have had ask that question! They covered this very same topic in the video where they go to the Bahamas on family vacation. How do I know this? Ummm....erm...I have a little sister. I'm sticking with that. I hate when something that is easy to do is described as being a "piece of cake." What the heck is that supposed to mean? How is a "piece of cake" easy?